At Classic Window Replacements we supply and fit the Palladio Composite door collection. Our showroom in Goatstown, Dublin 14 has a vast display of composite doors. Our expert team understand that your Palladio Composite front door is an essential aspect in the overall style of your home, but also composite front doors perform a vital task in keeping your home safe. Your new Palladio Composite door has to protect your home against intruders, keep the heat in and the weather out. At Classic Window Replacements we ensure that your Palladio Composite door is up to the task and that it is a beautiful and stylish addition to your home that stands the test of time. Enjoy the style, insulation and security that the Palladio Composite door brings to your home. Classic Window Replacements are an Irish-owned, family run business who guarantees that our clients receive the finest products and the best service on the market. 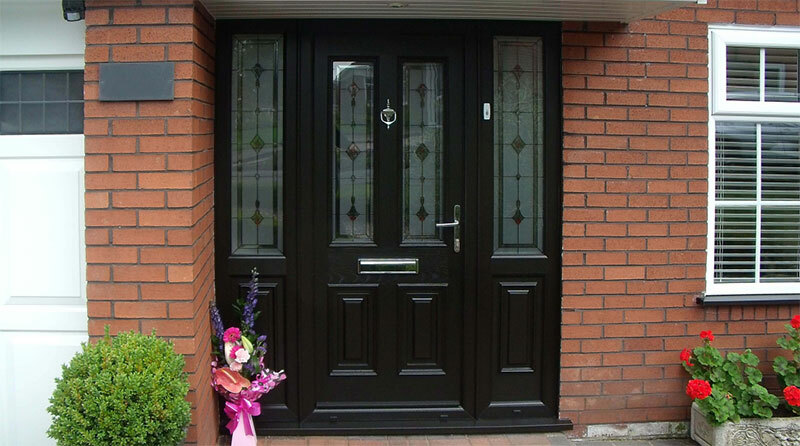 All of the Palladio composite doors we supply are the most secure, well insulated and weather proof composite front doors on the Irish market. Our collection of Palladio composite doors offers you the choice of 18 stunning designs in a wide range of beautiful colours to compliment your home. Every one of our Palladio composite doors is moulded from a real oak pattern for a deep grained finish that will look wonderful for many years to come. If you’re looking for a Palladio composite door in Dublin give us a call or pop into our showroom in Goatstown, Dublin 14, and our team would be happy to help. 65mm fibreglass reinforced Monocoque composite door. 77mm steel reinforced UPVC frame. The Palladio composite door has a double rebating system using two seals achieving excellent draught proofing. All hinges are rebated and can be supplied in white, brown or black. What is the U-value of the door? The door body U-value is -0.205, triple glazing U-value -1.1 and combined U-value of -0.64. What types of glass designs/obscures are available? There are a number of designs throughout our brochure to choose from to compliment your Palladio Composite door and side screens. We use triple glazed 28mm units using a warm edged spacer bar with a U-value of -1.1. Backing glass is available in clear or the following obscure options; Cotswolt, Minster, Stippolite and Flemish. All glass types are on display in our showrooms in Goatstown. Other obscure types of glass are available on request. Colours in all glass designs can be changed to suit your door colour choice. What door colours are available for the Palladio Composite Door? What is the minimum/maximum size of the Palladio Composite door? *We can make a slightly smaller overall width and height by using a 57mm frame instead of 77mm frame. What thresholds are available with the Palladio Composite doors? What security hardware is used with my Palladio Composite door? 2 hook locks, 3 shoot bolts and 2 sliding cams come as standard with the lever/lever and lever/pad handle options. PAS 23/24 approved security design. Escutcheon finger pull locking system has an automatic hook lock engagement when closed. Thumb-turn lock barrel available on request. This locking barrel eliminates the use of a key on the inside of the composite door for easy locking and unlocking when inside. Locking barrels: antibump, antidrill and antipick all available on request. What furniture is available for the Palladio Composite Door? Furniture is available is gold, white, chrome, brushed steal, black and bright bronze. What solid panels are available for my side screen(s)? We have a range of different types of solid panels to match your Palladio composite door choice. Please select our ‘Online Brochure’ to view images. Solid panels are used for the lower part of your side screen(s). *We also manufacture full length glass for your side screen(s) if you do not wish to have a solid panel.